Pizza, the meal for everyone. Over the years the world keeps evolving with trends, lifestyles, spirituality and traditions. The food industry has to ensure that it accommodates the needs of all people. Food is a source of life, it is also used as a social platform to engage with others. Food is usually present where important decisions are made or where milestones are celebrated. Whatever the occasion, season or reason, it is done in the company of food. As we have evolved as a species, so have our dietary requirements. It’s not nearly as rare to come across lacto-vegetarians, ovo-vegetarians, lacto-ovo vegetarians, pescatarians, vegans, those who are halal, banting, lactose intolerant or kosher, as well as the many other types of “tarians” out there. The upside is that as needs evolve, there is a meal that caters for all dietary requirements – PIZZA! During summer evening hangouts are the most fun. The weather is warm, everyone is cheerful and showcasing the latest fashion trends. All the best feelings that life has to offer until the decision on where to go and what to eat must be made. When a group of friends with different beliefs, allergies, diets, tastes and budgets meet for dinner. The where to go and what to eat is always the most difficult. There is Susan who eats anything, she orders a pepperoni pizza. John who is vegan orders a cauliflower tomato base pizza with olives, tomatoes and rocket. Sohail a Muslim who doesn’t eat pork orders chicken, mushroom and peppers with extra mozzarella. Then lastly Jill who is a vegetarian orders a margarita with extra olives. The group of friends are able to enjoy the same type of meal together regardless of their preferences yet taking into account their individual dietary requirements. It’s the meal that always wins – PIZZA. Some might argue that pizza is junk food but as the old saying goes, “everything in moderation”. When it comes to pizza it can be comfort food, health food or just plain old take-out yummy food. 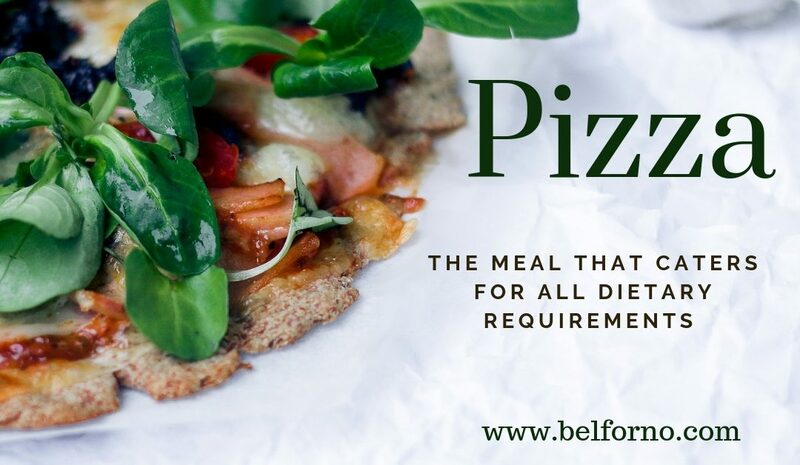 Rather than assuming that pizza is junk food, check out the nutritional facts and the health benefits of pizza which also consider the different dietary requirements. There are nutrients in the dough, depending on the pizzeria you visit. Most dough has antioxidants which are produced by the yeast used to make the dough. An alternative is beetroot (beets) which contains potassium which as we all know helps regulate blood pressure and assist with a healthy heart; it also contains minerals that prevent cancer and lowers your blood pressure. Another alternative is zucchini (courgette) which contains vitamin B6, has zero fat, contains antioxidants, anti-inflammatory properties, riboflavin; which helps the body break down carbohydrates, proteins and fats to produce energy, and it allows oxygen to be used by the body. For those who are really health conscious and enjoy the cauliflower alternative; it helps reduce the risks of cancer as well as contains vitamin k and c and reduces high blood pressure. Traditional pizza sauces are tomato-based. The basic ingredients of the sauce are tomatoes, oregano and olive oil. Tomatoes contain potassium, vitamin C, are full of antioxidants which help in fighting cancer, lycopene which reduces the risk of heart disease and cancer; it contains potassium and vitamin C.
Oregano contains antioxidants, protects the liver and balances blood sugar levels. It is the final stage of determining what type of pizza you prefer. What’s most important is the toppings you choose. This determines the “healthiness” of the pizza. Most meat contains sources of protein and fat, if you were on a banting diet you would ensure your pizza has steak on it, however if you were on a low-fat diet you would choose chicken or seafood. The great thing about meat is that whatever religion you practice the pizzeria will always cater for your needs. Vegetables, the good stuff. Any type of vegetable is good but the three favorites for the health conscious are bell peppers, mushrooms and olives. Vegetables are a good source of vitamins and antioxidants and create a healthy balance when added to your pizza. Bell peppers contain three different vitamins: Vitamin A, B6 and C. It also contains antioxidants, nutrients that ensure healthy cells, support the metabolism as well as the immune system and digestive health. Mushrooms contain B vitamins as well as a powerful antioxidant called selenium, which supports the immune system and prevents damage to cells and tissues. It also contains therapeutic properties that assist body functions and reduce cholesterol. Olives are high in vitamin E and contain other powerful antioxidants. Studies show that they are good for the heart and assist in protecting against osteoporosis and cancer. Ask anyone and they’ll tell you that their favorite thing about pizza is its oozy, stringy, cheesy deliciousness! There are many types of cheese and most cheese, in moderation, is in fact healthy. Cheese contains calcium as well as vitamin A and protein. Feta, cheddar, mozzarella and Swiss are some of the varieties of cheese that have the most health benefits. Mix all those cheeses together and you have an explosion of flavor in your mouth. As many of us know, processed foods contain very few nutrients and little fiber and contain more calories and fat. A nutritional fact is that pizza is not processed food. Most pizzerias use fresh vegetables and fresh cheese for their pizzas. To sum it up, there are worse choices than pizza for the health conscious and it’s a meal that brings people together! We are a manufacturer of authentic wood-fired, gas and dual fuel ovens that we deliver to your home in a ready-to-assemble kit. Belforno ovens are designed in the Italian tradition. We use only the finest refractory ceramic materials to hold heat for long periods of time. This provides superior cooking results. Contact us for more information.